can a nida apply eyedrops to her husband? A nidah is not allowed to touch her husband directly. how about something like dropping eye drops into her husband's eyes (ex. not sick. just for mild dry eyes, no one else can do it). Is this included in the prohibition? Rav Elyashiv (קובץ תשובות חלק ג' סע' קל"ח) paskens that it is permitted. 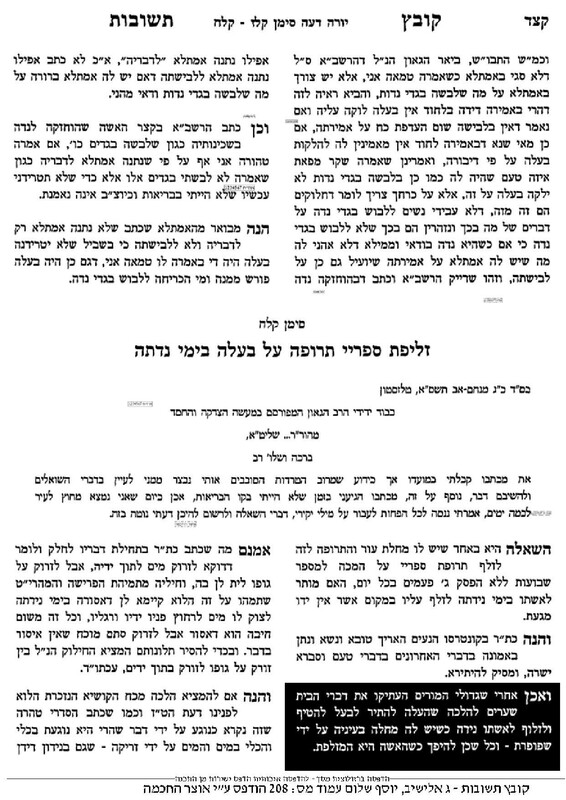 In sefer Mareh Cohen(Rav Yitzchak Rubin) he says its permmited. If she needs to open eye then she should use a davar chotzetz (cloth). Not the answer you're looking for? Browse other questions tagged halacha niddah . Can we really bind people to social contracts? How must a woman dress in front of her husband during her days of niddah? (How) can a man seek favor from (or woo) a potential bride and/or her family? Where is there a discussion where one can understand Devarim 23:25 fully?